Ekiga is an open-source instant messaging & VoIP application for the Internet users. You can make telephone calls over the Internet, start a video conference, and chat with your friends using instant messaging features. The application supports major telephony standards such as H.323 and SIP protocols, including other SIP compliants and Microsoft NetMeeting. It is possible to configure the settings with the help of a wizard. There you can save your name, set up your SIP or H.323 account, select the connection type, configure audio parameters, and choose your video input device. Ekiga for Windows boasts a neat and intuitive layout that enables you to set your availability, enter a status message, display offline contacts, view images from your camera device, and even switch between three display modes: contact list, dialpad, and call history. The program lets you pick or reject phone calls, hold or transfer calls, hang up video or audio streams, zoom in or out, as well as enable the full screen mode. On the other hand, the IM interface is quite simple and basic. You can send messages to your friends, use emoticons, work with a multi-tabbed layout, as well as switch to bold, italic or underline mode. It even has a built-in address book to keep a track of your call record. 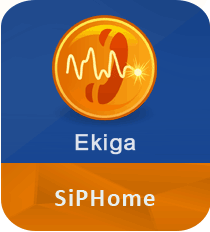 You can add a new contact to the list by entering the name and Ekiga SIP address. Furthermore, you can also assign preset or custom group to all your contacts. The account manager option allows you to manage all your accounts, as well as enable, disable, edit or remove them. With the help of Ekiga softphone free version, you get various customization options in order to add your full name, display video streams on top of other panes, enable call forwarding, set up network detection, and many more. Download Ekiga to make your voice calls free over the Internet. > Supports standard telephony features such as Call Hold, Call Transfer, Call Forwarding, etc. Earlier known as GnomeMeeting, Ekiga packs all the essential elements to connect with your loved ones, no matter where they live. This video conferencing tool is suited for novices and experts alike.